In this article I will outline and review my own personal experiences racing and cycling indoors with Zwift. I will make comparisons to training indoor versus outdoors and the benefits I’ve obtained in crterium racing by using Zwift as an effective training tool and an alternative to racing outdoors. For the modern amateur athlete, criterium racing, or really any type of road racing, is a difficult discipline to specifically train for. Most coaching programs will pull it together for you piece-by-piece over a number of weeks/months until you have maximised your potential via a strong baseline and then specialised in a few specific areas that are likely to be vital on race day, depending on the course. Others might say “there’s no training like racing”, and both are right, to some degree. But if you plan on using your racing for training and spend the rest of the week gallivanting around town in your shiny $600 cycling kit, you’re probably in for a few headaches in the months to come, once the racing season gets underway. Crits are notoriously hard to train for on the road. A combination of weather, timing, and traffic will usually conspire to prevent you from completing the type of aggressive and repeatedly sustained efforts required to progress your arsenal of experience, ultimately giving you an edge over the opposition. Personally, I started seeing my crit results increase three seasons ago when I had a lull between work contracts. I undertook a mental health makeover and sold my Xbox for a Jetblack Z1 classic trainer. Combined with a couple of enjoyable training videos, the aggressive and sustained intervals needed for those final three laps had been found, and the trainer now allowed me to make those sustained efforts without increasing my personal risk on roads to unacceptable levels, or trekking halfway across town for a 40 minute spin class. Some people hate the stationary trainer, but I personally took to it with gusto. It’s really just a personal thing that you will either love or hate… Eventually I broke that Z1 trainer while training for the Perth Worlds in 2016. It was replaced with a Wahoo Kickr for a very specific purpose. The Wahoo Kickr is definitely compatible with Zwift technology and is the trainer of choice for many Zwift users. 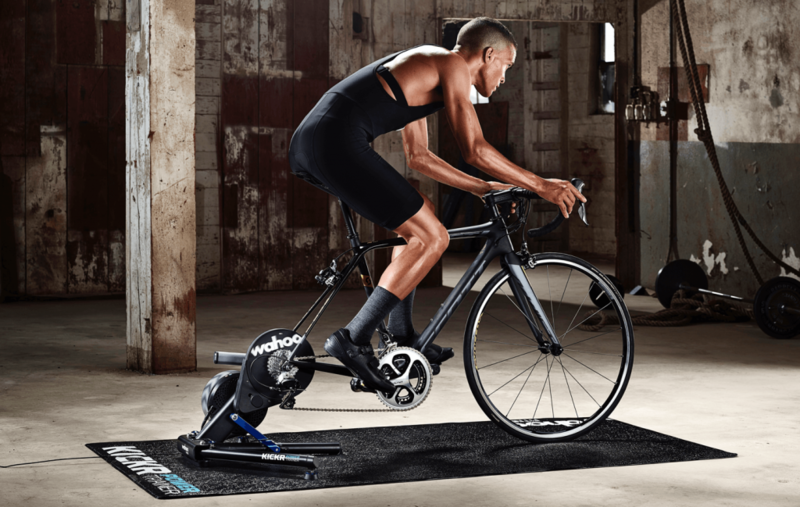 With its individual workouts, group workouts, and even racing; a wide range of choices are available for your indoor training appetite. Zwift racing is by far the most difficult effort I’ve ever made on the bike due to the ‘non-stop’ nature of the race. 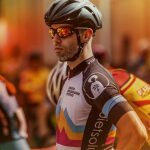 For a full hour, your legs just don’t stop – you’re either in the pack or out the back, which is perfect preparation for getting to, or competing in A Grade criterium racing. My best power efforts over one hour are always found on Zwift, where the all-important sustained late race power is often the deciding factor. 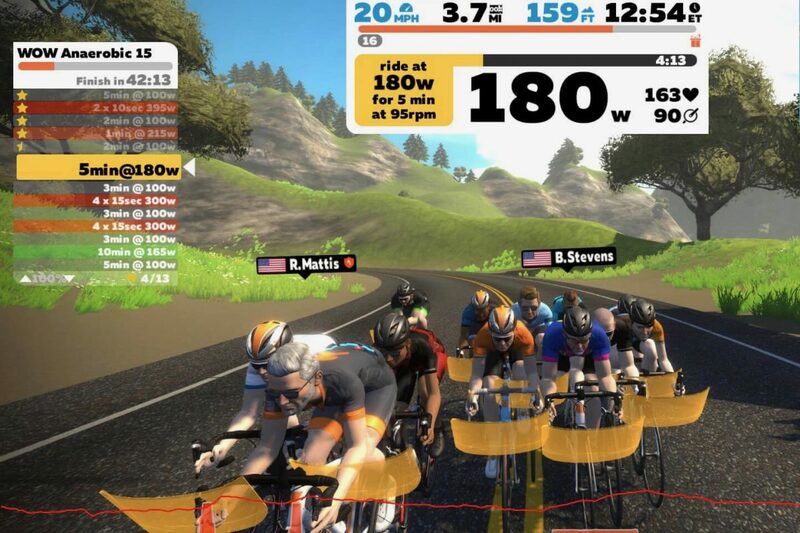 Racing on Zwift isn’t anything like offline racing. The starts are hard and incredibly fast – so be prepared to set a few one and two minute power PB’s in the process. I was lucky during my first Zwift race, as I arrived so close to the start time that I was somewhere down the back in a 90 rider field, thinking to myself that I’d better charge hard early on and make up a few places. BOOM went the start gun and unbeknownst to me 60 seconds later I had made the perfect start to find myself in the A group on the first lap – not that I remained there later on, however! There I was waiting and waiting and waiting for the pace to settle, but the settlement never came. On we charged, seemingly intent on destroying not only those who had dropped off behind us, but also our preciously expensive smart trainers which enabled this increasingly silly expedition in the first place! I popped at the 20 minute mark, unable to sustain the relentless pace but safe in the knowledge that my indoor training was about to click up a few gears. The main difference here in that even in an A grade race, there’s at least a small amount of recovery time. This was my training set up for a number of months. 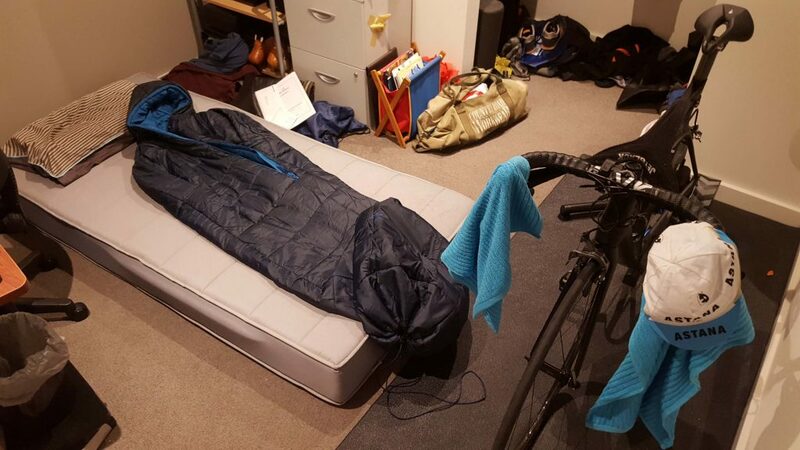 So I didn’t wake anyone in the house with my early morning footsteps, I slept next to the trainer with Zwift racing ready to roll. Racing of the Zwift nature will give you the high end, late race baseload required to stave off lactic induced fatigue more efficiently than your rivals. This is wholly unlike winter road racing at a club level, which generally involves allot of coasting with the occasional bout of speed when someone who’s already well rested decides they’d like to make some sort of exploratory attack, followed by a late flurry at the end. Get boxed in, get a puncture, or simply have a bad race, and its two hours of packing down and then driving home while you curse your bad lack and seriously contemplate your life decisions. Conversely, when child minding activities prevented me from competing at my local on a Wednesday night, I turned again to Zwift. The effect was immediate – at my local midweek race, I can average around 220wt for 35 minutes, whereas during a Zwift race I could average 260wt for a full 60mins, perfect preparation ahead of the weekend clubby, a full 60 minute race. The full race distance without even a hint of a break boosted my weekend prospects immensely. The effect of this training is like much we see in pro riding: it’s no surprise that riders like Cadel Evans, Michael Matthews, and Rohan Dennis all come from places like Canberra and Barwon Heads – places where they could simply pedal without worrying about sustained effort interference from traffic lights or roundabouts. 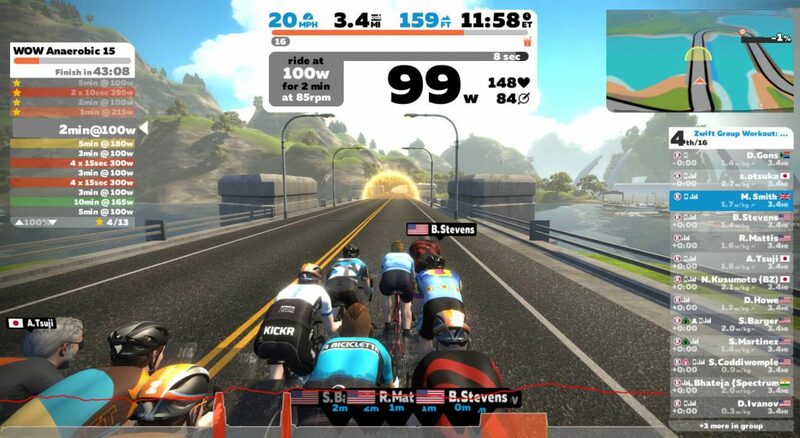 Another brilliant feature of Zwift is the ability to work on your specific weaknesses – in my case, over/under efforts are used to practice keeping the hammer down after a Vo2 effort, or perhaps a few 20 minute hill repeats at an FTP effort that would otherwise take one hour of riding simply to arrive at. Another great feature of racing online is the Zwift Power website (ref) which documents all your results and shows your power PB’s (20m/10m/5m etc…). Meaning, you can track your progress! Basically the more you race, the better your body will adapt to these new type of sustained efforts, giving you more breathing space to make those hard attacks out of the pack. Most of my power PB’s between 5 minutes and 60 minutes have been on Zwift racing, you simply can’t replicate those fearless and ultimately safe racing efforts on the road. The peloton provides slight relief from the pressure, as you get a virtual draft However, the pressure on the crank is far more brutal than your typical on road criterium race. Such has been the effect of Zwift racing on the cycling community that specific racing series have been born out of the online platform. The KISS Australia E-Crit series was a revolution in the racing community, taking the power outputs required to compete beyond the reach of most individuals, but salivatingly exciting for those who possess such an FTP. An International racing series available in my living room? Yes please! Only a few short years ago, this type of racing was logistically unavailable or perhaps the risk levels unacceptable to those whose trades depend on avoiding serious injury. Zwift, however, could just be the start. Virtual Reality is experiencing a revival in the technology industry and with 5G mobile broadband on the horizon, we really could just be witnessing the beginning of the online cycling revolution. Becoming a better racer is about putting yourself into the fire time-and-time-and-time again, until you come out on top. With Zwift racing, you have that fire at your personal disposal.